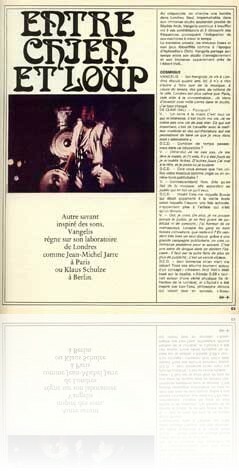 Having released the album ‘Beauboug’ the previous year, and about release his new album ‘China’, French magazine Rock et Folk sent journalist Dali de Clair to interview Vangelis at Nemo Studios, 1979. 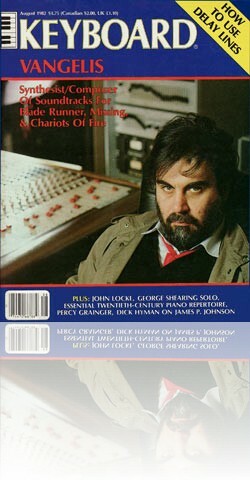 Vangelis was interviewed by Bob Doerschuk, in the summer of 1982, by US magazine Keyboard, after winning an Oscar for his soundtrack to Chariots of Fire. 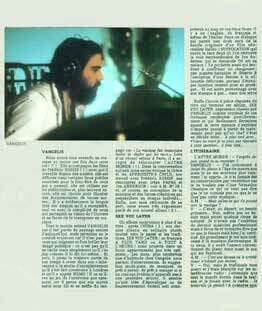 While on a short visit to Paris in 1980, French newspaper L’Autre Monde conducted an in-depth interview with Vangelis, taking a look at how Vangelis started his career in music, his ideas, his works and his collaboration with Frédéric Rossif, Irene Papas and Jon Anderson. 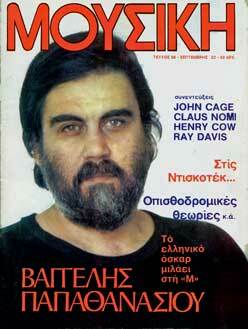 Vangelis was in Greece in 1982, on a short visit and was interviewed by Greek magazine Musiki . Topics they discussed included albums such as ‘Earth’, ‘May’ ‘1968’, ‘666’ and ‘Chariots of Fire’. 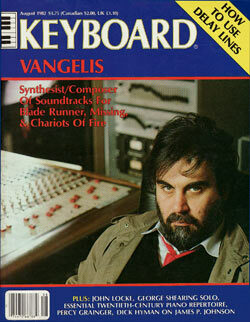 The Sunday Telegraph conducted an interview with Vangelis in September 1982, after having completed the film score to Blade Runner. 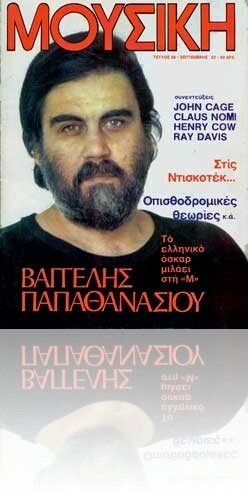 Journalist Gilles Bédard, working for Canadian magazine Hi-Fi Sound, conducted an in-depth phone interview with Vangelis at his studio, in November 1982. 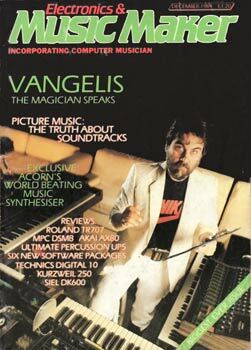 UK magazine Electronics & Music Maker sent journalist Dan Goldstein to Nemo Studios to interview Vangelis in November 1984, who talked about recent synthesiser technologies, among other topics. 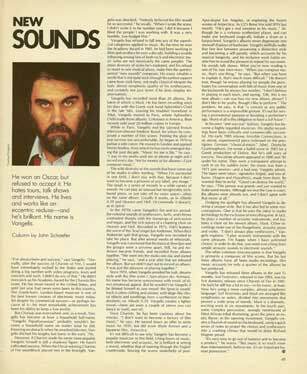 Journalist John Schaefer interviewed Vangelis in June 1985, on his recent success for US magazine Spin. 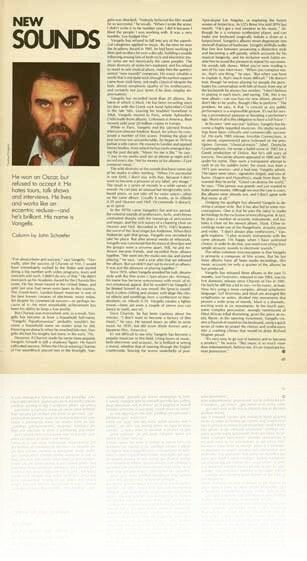 When browsing the ‘Interviews’ section, magazines can be thumbed through by using the arrow keys on the keyboard, or via the provided ‘Scroll Bar’ using the touch screen. Alternatively, if using a mouse, the ‘Mouse Wheel’ can be used to thumb through the magazines by rolling the scroll wheel. To achieve this, place the mouse pointer over the disc, then use the ‘Scroll Wheel’ to sift through the items. 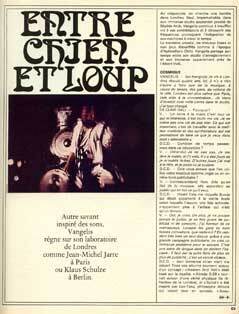 To read the interview, select and click on the magazine cover above. 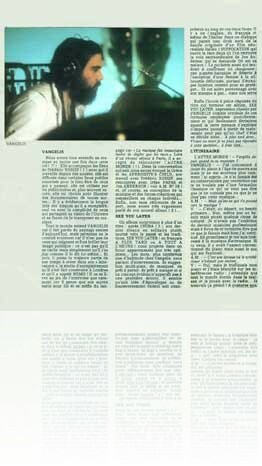 Click on the link ‘Read the Interview’ to open the magazine..